Note: This is an update to my article of 10/7/17. Nothing has been removed or edited from the original article. This updated article includes additional financial/trading anomalies I have uncovered since posting the original piece. 1) Additional trading research on OSIS (OSI Systems), the global leader in baggage, shipping and people detection systems (airports and now MUCH more, like hotels/casinos). Like the other 4 co’s that I have found, OSIS also began to rise on 9/11/17 (remember this date as you will see it in each company) and it rose on large share/option volume increases. The shares of OSIS would rise as much as 16% from its 9/11/17 lows to just after the attack. 2) OLN (Olin Corp) makes Winchester ammunition. Beginning on 9/11/17 their shares began to rise on a large increase in volume and a HUGE increase in call option purchases (so far I’ve found more than 6000 calls were purchased in OIH the week prior to the attack with someone making a ton of money in these calls). The shares of OLN would soar as much as 23% from their 9/11/17 lows to just after the attack. Note: With this report, I make no claim to specific knowledge of any wrongdoing or improprieties. Instead, this report includes trading patterns, news releases and/or public record SEC filings. We will examine the share price movements of two gun manufacturers (American Outdoor Brands and Sturm Ruger) and the share price movement of MGM (which owns Mandalay Bay). We will also examine additional financial events surrounding MGM, including what can only be referred to as massive levels of insider selling in the shares of MGM, by the CEO/Chairman and MGM officers/directors. As you’ll see, more than $200 million in MGM shares were sold in the weeks leading up to the attack. Background. Interesting Trading Patterns in AOBC, RGR and MGM. Over the course of my 32 years in the investment industry I have constructed a proprietary investing model that I refer to as the “VRA Trading & Investing System”. In short, its design is to track money flows in the stock market and detect sector and stock analysis/movements that then alert me as to when/where money is flowing in the markets. For example, prior to the 2016 Presidential Elections, the VRA System noticed that the share price of gun manufacturers had begun to decline rapidly. This was one of our first financial clues that Trump might beat Clinton (Trump’s strong support of 2A). As you can see below, American Outdoor Brands (AOBC, formerly Smith & Wesson), hit a high of $31/share in August of 2016. As the bottom began to fall out, it would ultimately drop 55% in price, before hitting its low price of just over $13 on 9/11/17. The market is referred to as a “discounting mechanism” and as such, it often predicts future events. It certainly did so in the case of the election and the share price of AOBC. 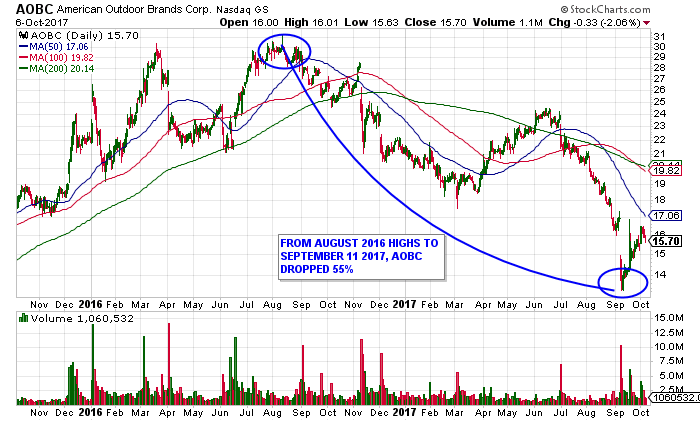 We see the same trading pattern in gun manufacturer Sturm Ruger (RGR). RGR traded as high as $73 in March of 2016 before ultimately dropping 37%, when it too bottomed within one trading day of AOBC hitting it’s lows (9/8/17). Again, my system noted the rapid decline in gun stocks, which led me to believe that Trump may in fact win the election. Remember this point; both AOBC and RGR hit their lows at the same time, just over two weeks prior to the Las Vegas shooting. 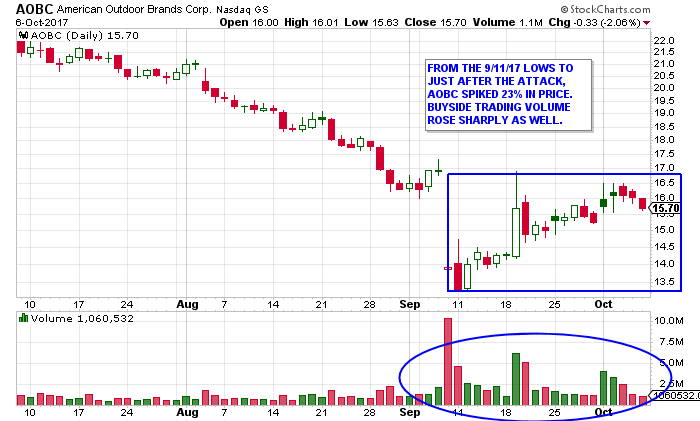 Let’s now examine the trading patterns of AOBC and RGR in detail, just over two weeks “prior” to the attack. As you can see, AOBC bottomed on 9/11/17 at $13.30 before the spike higher began. 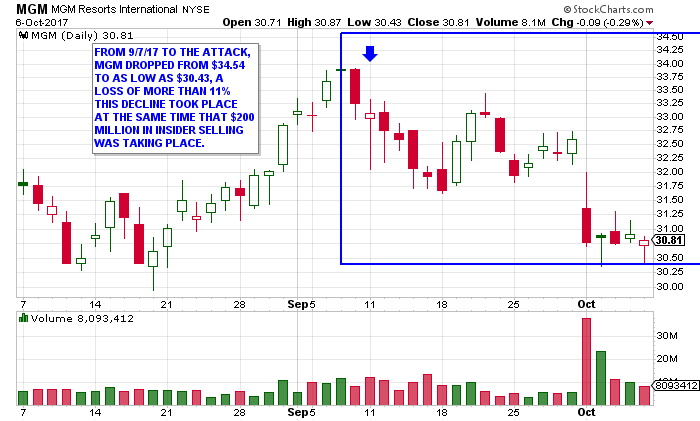 From 9/11 to just after the attack, AOBC rose 23% in price. 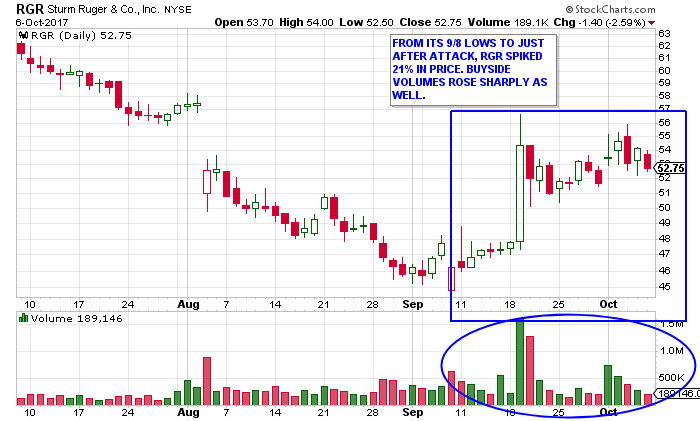 It did so on a noticeable increase in buy-side trading volumes. Below, we see the same chart and reaction in the shares of Sturm Ruger (RGR). 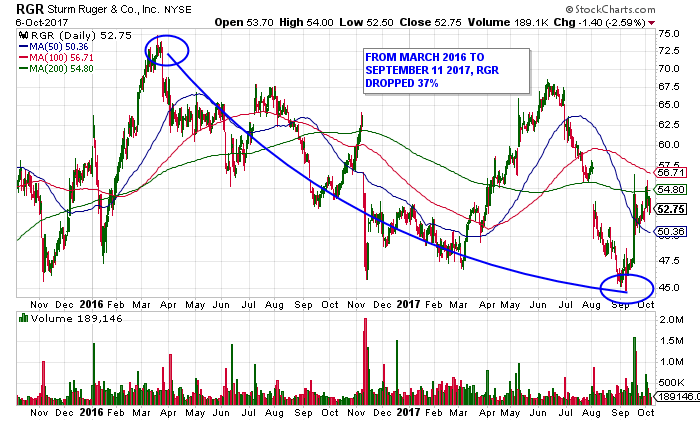 From its 9/8/17 lows, RGR bottomed at $46.24 and then spiked to $55.90 just after the attack, for a move higher of 21%. After falling in price from early-mid 2016 to their early September 2017 lows, the two largest publicly traded gun manufacturers bottomed, then spiked higher, at almost exactly the same time. In addition, buy-side volume increases rose sharply as well.And, while not covered in this report (more work is needed), we also saw a spike in call option purchases in both AOBC and RGR, in the days/weeks leading up to the attack. This final chart shows the share price of MGM (owner of Mandalay Bay) in the days leading up to the attack to present. MGM shares declined more than 10%, from 9/7/17 to recent lows. This decline occurred as some $200 million in insider selling was taking place. Bottom line: Beginning in early-mid September to this report, gun manufactures AOBC and RGR rose in price 23% and 21% (on higher trading volumes), while the shares of MGM fell in price by 11% (as $200 million in insider selling occurred). As the SEC insider transaction reports below detail, from 9/5/17 to 9/12/17, approximately 6 million shares of MGM were sold by officers and/or directors of the company, totaling approximately $200 million in proceeds to sellers. Included in this group is the selling of approximately 450,000 shares by MGM CEO and Chairman James Murren (a seller of size since late July) and who appears to have sold more than 85% of all holdings. We also see that MGM Board member Grounds William Warwick sold 176 million shares of his MGM stock on 9/6/17. We have no indication that MGM insiders sold these 6 million shares due to any advance knowledge of the 10/1 attack. I am not making that claim. I am simply pointing out facts that cannot be in question. 1) If MGM/Mandalay Bay were to lose law suits associated with this attack, the downside risks to MGM share price may be extensive. 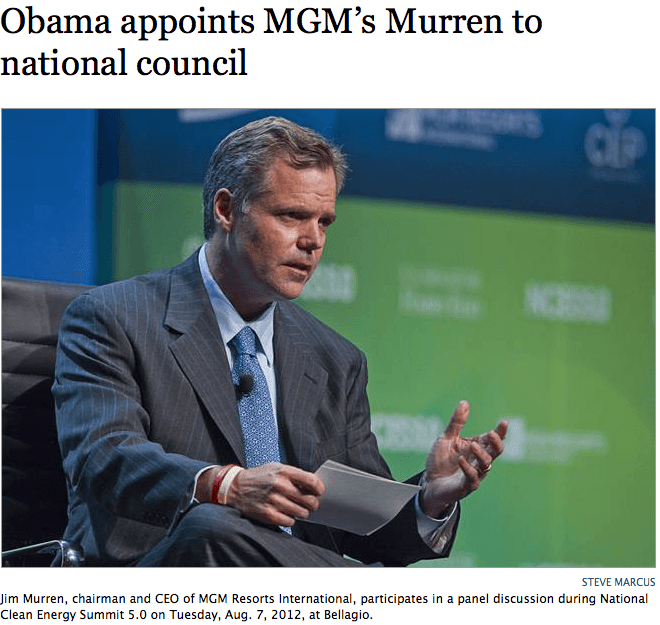 2) We also know that MGM CEO James Murren was appointed to the Homeland Security National Infrastructure Advisory Council by President Obama in December 2013. This fact could make for some interesting depositions, as it relates to exactly what type of advanced security systems Mandalay Bay had in place, leading up to and on the night of 10/1/17. 3) I am also aware of the fact that MGM put options activity spiked as well (needs more work), beginning at the same time gun stocks were rising and MGM was falling in price. 4) For those curious about the trading in other major Las Vegas Hotel casino stocks, during this same time frame, this also needs more work. However, I can report that at the same time MGM’s share price was falling, the share prices of Las Vegas Sands (LVS) and Wynn Resorts (WYNN) were actually rising. There’s more…like the recent trading pattern in OSIS, which makes “detection systems” of all kinds (similar to their subsidiary “Rapiscan”, which makes the TSA body scanners that were put in place following 9/11). Many are wondering how long it might be before we are forced to walk through similar devices, as we enter hotels/casinos. In my original piece I only mentioned OSI Systems (OSIS) and their trading pattern around the Las Vegas attack. I’m updating this to include the chart from the same time frame and additional comments. Below is the chart of OSIS. From the lows of 9/11/17 to after the attack, the shares of OSIS have jumped 16%. In addition (more work is being done here), call option volume also spiked higher, 2 weeks before the attack. I have also confirmed that OSIS is working on plans to place their baggage/people detection systems in hotels/casinos around the world. Deepak Chopra is the CEO and Founder of OSIS. Here’s another interesting piece to the puzzle. Olin Corp (OIH) makes Winchester ammunition (among other things). Beginning on 9/11/17 their shares began to rise on a large increase in volume and a HUGE increase in call option purchases (so far I’ve found more than 6000 calls were purchased in OIH the week prior to the attack. Someone is making a ton of money in these calls). The shares of OLN would soar as much as 23% from their 9/11/17 lows to just after the attack. I am also including the anonymous 4 chan post (below) that everyone is talking about. As I see it, these are (among) the 5 publicly traded companies that the planner of the Las Vegas attack would want to target. 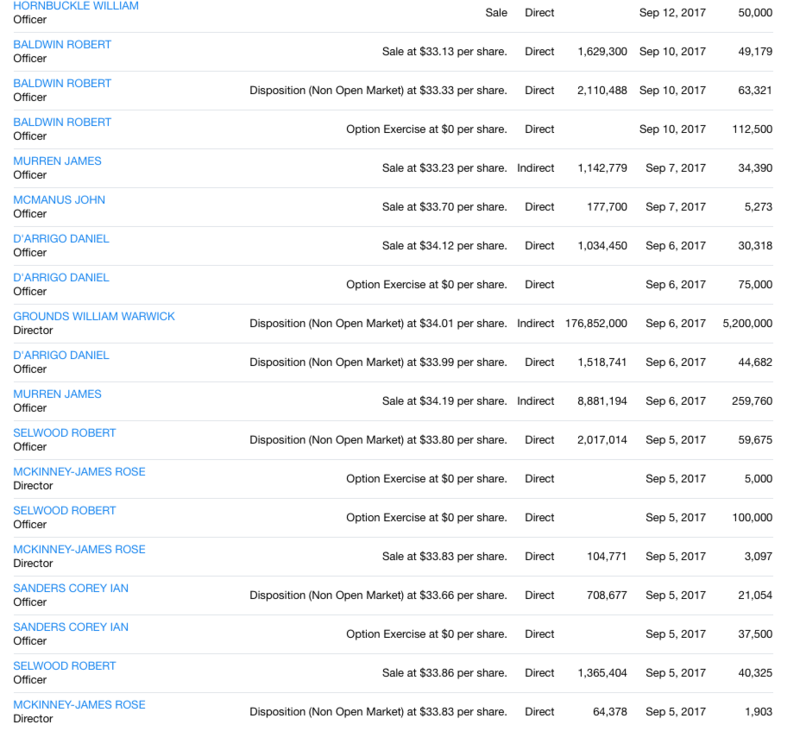 It is most interesting that each of these stocks began their moves on 9/11/17, just one day after the 4chan post. This is what we know after less than 1 week after the attack. What might we know in another week? In closing, let me repeat; I make no claims or assertions that anyone mentioned in this piece has done anything nefarious. They likely did not. Like many of you, I am interested and I am asking questions. I also remember that during 9/11/01, reports surfaced widely in the financial media that “many, many millions” in profits were made off of the purchase of put options in the shares of United Airlines and American Airlines, the two airliners that operated the four aircraft that were hijacked on 9/11 (among other well-documented reports of large put option purchases in numerous companies that had the most exposure to a shocked US economy). I will continue to follow this story. Should you have information that might assist in my research, you can reach me at kip@vraletter.com. I am a proud American. I want the best for our country. Wherever the truth leads us, that is where we must go. Follow the money.